Catastrophe is a multiplayer platformer/brawler where players must compete for space atop buildings to escape an oncoming flood. However, the buildings are unstable, and can only hold a certain number of players at a time, so you have to be careful, or your safe spot will come crumbling down! There is no limit to the number of players in Catastrophe. Use your smartphone as a controller and drop in at any time. Our team wanted to create an experience where players would have fun cooperating and competing simultaneously. To achieve this, we implemented dynamic building holding capacity. The buildings in-game would always have enough space to hold all players, however, each building could only take a maximum number of characters before collapsing. 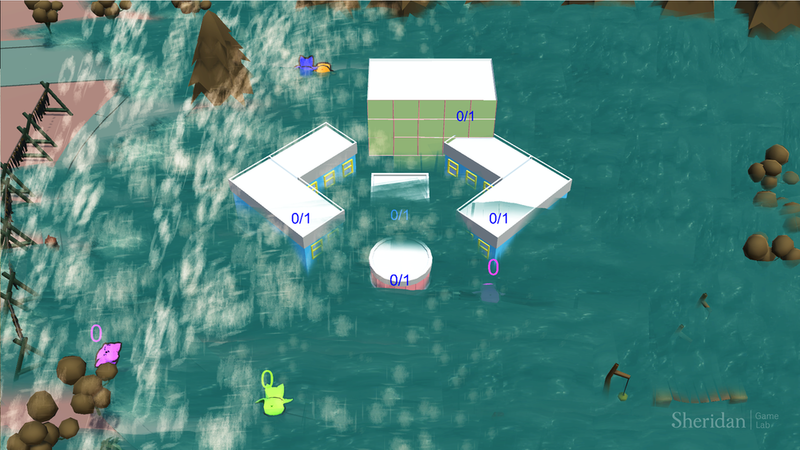 Emergence is generated by players deciding among themselves whether to cooperate so all could survive the flood, or to compete and sabotage others.